Khemorada displays his exceptional walk and conformation. The moment they saw weanling HS Kolors Khemorada (Kolors+// x Triumphs Twizder) in Oregon, they knew he was special. Two weeks later Tammy Hayward and Glenda Miller were bringing the beautiful colt back to Canada with them. Standing at 15.1 hands, Khemorada has the talent and mind to go in any direction. In addition to being a Khemosabi++++// grandson, his dam is a daughter US National Driving Champion and Halter Champion Gai Parada+++/. His sire, Kolors+//, has wins from Regional through Reserve National Champion in Trail, Hunter Pleasure, Western Pleasure, Dressage and Working Cow. Khemorada earned versatility honestly! Khemorada taking ribbons at Region 17. Undefeated in Sport Horse In-Hand, Khemorada, like so many of the Khemosabi++++// line, is not satisfied with winning in one arena. 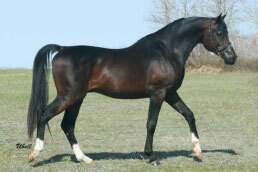 He also has wins in Halter, and in 2010, garnered several wins in Hunter Pleasure. 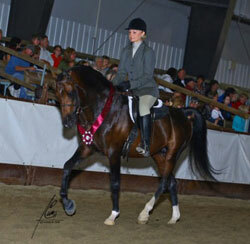 He capped off the year by taking Region 17 Top Five Hunter Pleasure Junior Horse honors. Aphrodyte with Tammy at the 2010 Regionals. Although only six himself, Khemorada's daughter Aphrodyte is already strutting her stuff as a yearling. 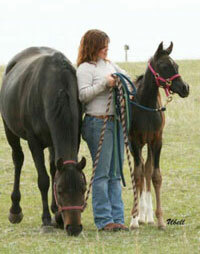 Entered in HA/AA Yearling Halter in 2010, she earned a Top 10 at Region 17. Tammy adds, "Several more will be hitting the ring in the near future and I'm quite sure are destined for success." Tammy explains why she finds herself drawn to the Khemosabi bloodline. "Of all the Khemo bred horses that I have owned - I find that they have many wonderful attributes making it very difficult to prioritize which I like the best. Some of the things that attract me to the "Khemo" stuff includes the undeniable excellent temperaments, always so calm and willing, extreme athleticism, proven versatility, great movement and conformation, and of course those great big soft dark eyes." Some other Khemosabi-related horses she's owned have been Khrista (Khaeczharb x El Kaylah) from George and Doris Husband. Tammy shares that "Khrista has been shown in Halter, Liberty (always wins with her great movement), Western Pleasure, Working Cowhorse and Cutting. She is currently training for Reining for 2011." They liked Khrista so much, they bought her sire, Khaeczharb, by Khaaleb, a Khemosabi son who was a gift from Bert Husband. A former Western Pleasure and Racing competitor, they thought the 20 year old would be glad to retire. Instead, Tammy relates "He made quite a comeback at age 21 through 23 - with many wins in Western Pleasure and Working Cowhorse, as well as showing in Trail and Halter." 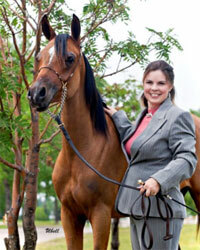 Tammy explains how Hayward Arabians became Khemosabi-based. "We didn't plan to focus our breeding program around the Khemosabi bloodlines but it stuck once we got a few horses that carried those lines and now we're hooked."